Riding the tram in Penang Hill to enjoy the view of the island is the classic way of seeing Penang. When the British ruled the country, the hill was used to plant strawberries. But after repeated planting failures, the hill is transformed into a place for locals to get away from the congested city’s tropical heat. The tram ride is the main attraction here and the view second. Come if you want to enjoy the view of the seas and the city while sipping a cup of coffee. There’s a small owl museum, local food court, the oldest temple in the island and some old bungalows dated to the 1800 you could see. Sadly the bungalows are off for the public. If you are here during the weekend, the place is usually crammed with people and events. Make your way here as early as you could. Otherwise, the queues waiting to get on the tram will be daunting. 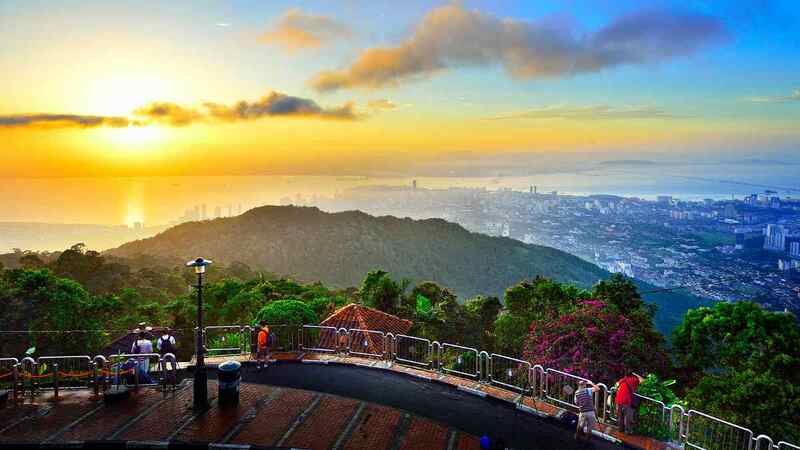 NOTE : The latest attraction to Penang Hill now is the Habitat. For those coming in groups and think that trams are not as fun as hiking, there are 2 jungle trekking packages offered. 1. From the west. This 3.8 km hike will take 2 hours. 3. From the bottom station. This is a longer, more tiring trip as you need more than 5 hours to get to the top. Waiting time could reach up to 45 minutes if you come during the school holidays ( Dec & March). To beat the queue, come here early, or get the express passes.